TM – L90 - High speed, High performance! Whether they contain barcodes,addresses, or other vital information, printed labels are fast becoming a necessity in a variety of consumer-orientated businesses. For retailers of all kinds, ticketing agencies, post offices or delivery companies, a fast, accurate and versatile label printer has become an absolute must. And that is where Epson comes in. The fastest label printer in its class*and the first of its kind that can print in two colors* the TM-L90 is revolutionizing the way that labels are printed. The TM-L90 is so easy to use that it requires almost no training for even the most inexperienced of staff. With no complicated paper feeding, the drop-in loading method allows operators to open the door and load new paper in a few short seconds. There is nothing more annoying for you and your customers than paper jams. Not only are paper jams unlikely with the TM-L90, but they are easy to clear when they do occur.A long lifespan allows your TM-L90 to print up to one million labels or twenty million lines. 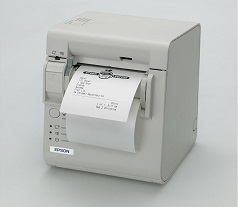 The Epson TM-L90 can be operated using all standard commands and drivers for the retail environment.